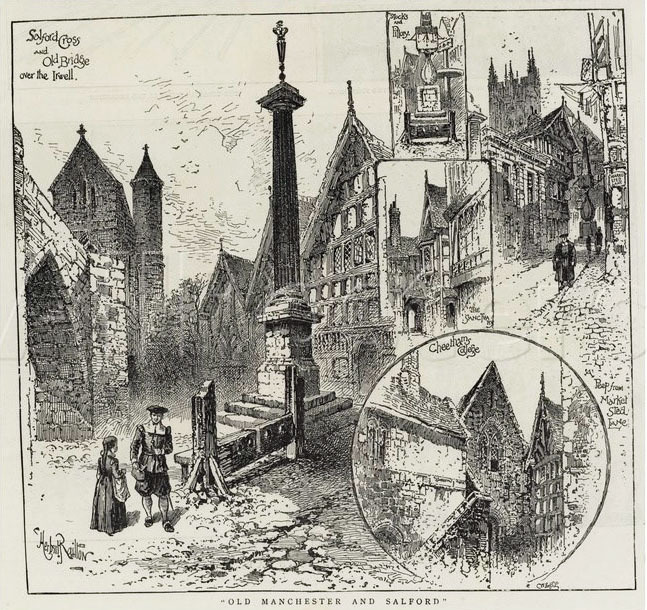 Drawn by John Ralston and on stone by G. Harley, the figures by D. Dighton. Source: The Graphic, 7 May 1887. 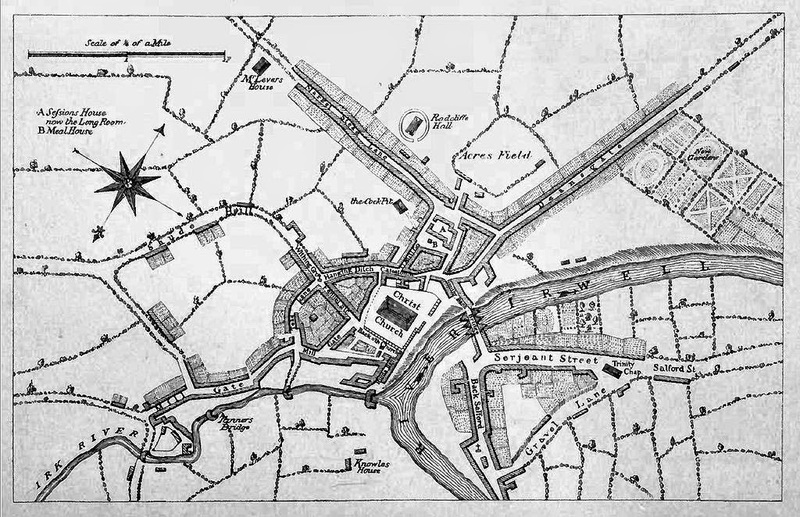 The oldest part of Salford was contained within a triangle of land bounded by the River Irwell, Chapel Street, Gravel Lane and Greengate. 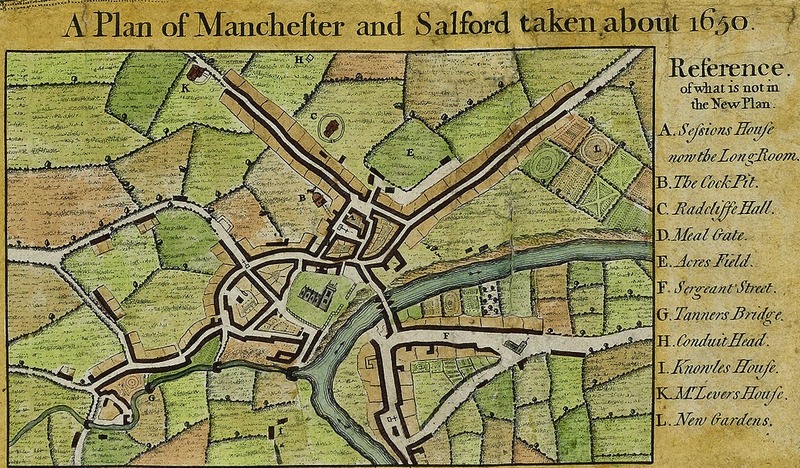 The location of the Salford Cross is marked in red on the map below. It stood outside the Bulls Head public house. Standing crosses serve a variety of functions. 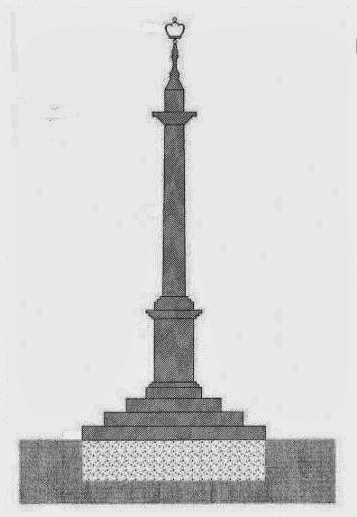 The purpose of the Salford Cross is suggested by its iconography. It is not a crucifix, and therefore unlikely to be religious in nature. It carries a crown, indicating a secular function, which is emblematic of the monarch's power and government. 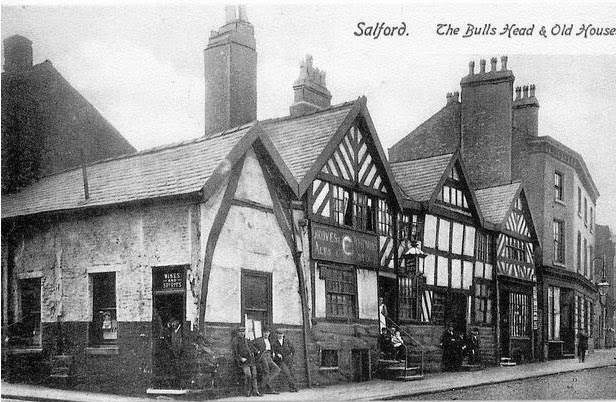 It seems likely that the Salford Cross was proclamatory. Even so, there is a long tradition in England of 'Preaching Crosses', so it easy to understand why John Wesley chose the steps of the Salford Cross to preach to a hostile crowd in May of 1747. 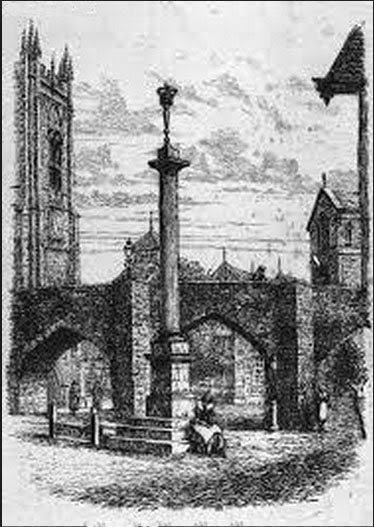 That it was a market cross has been discounted. Generally, it served as a meeting place in an age devoid of methods of mass communication. 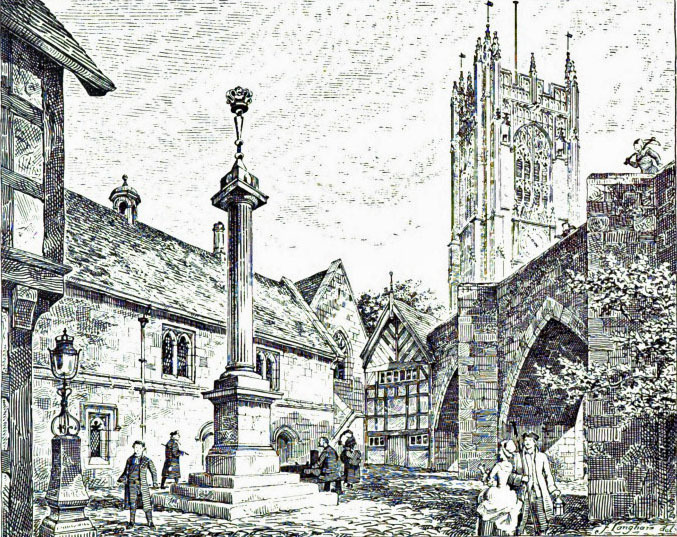 By extension, it also served as a place where public punishment was meted out, and why the stocks are beneath the cross (see illustrations above). On 19 July 1821, some forty thousand people walked through Manchester and Salford to celebrate the accession of George IV. 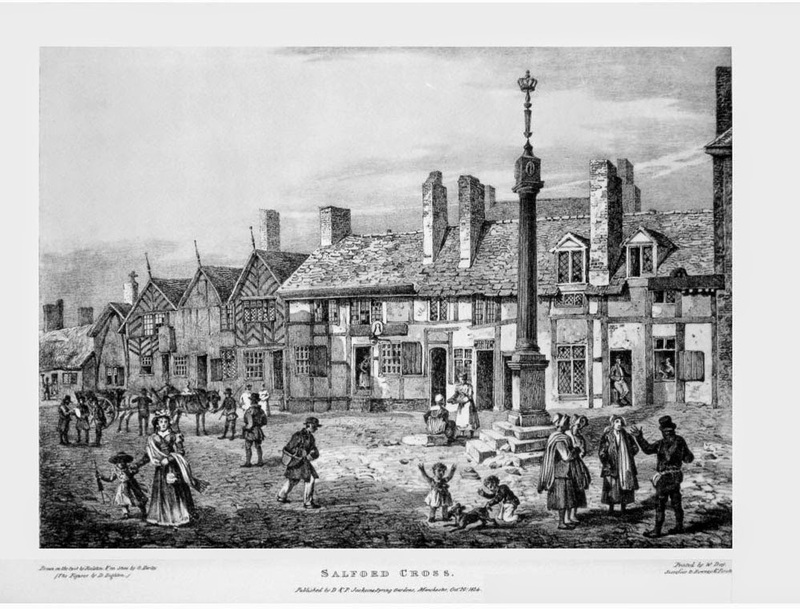 The Salford Cross was one of the appointed stations along the procession route, which distributed roasted oxen and sheep, bread and strong ale resulting in a scene of 'tumultuous rejoicing". The procession, including over 25,000 school children, trade representatives, local dignitaries and the miltary, was estimated to be five miles long. 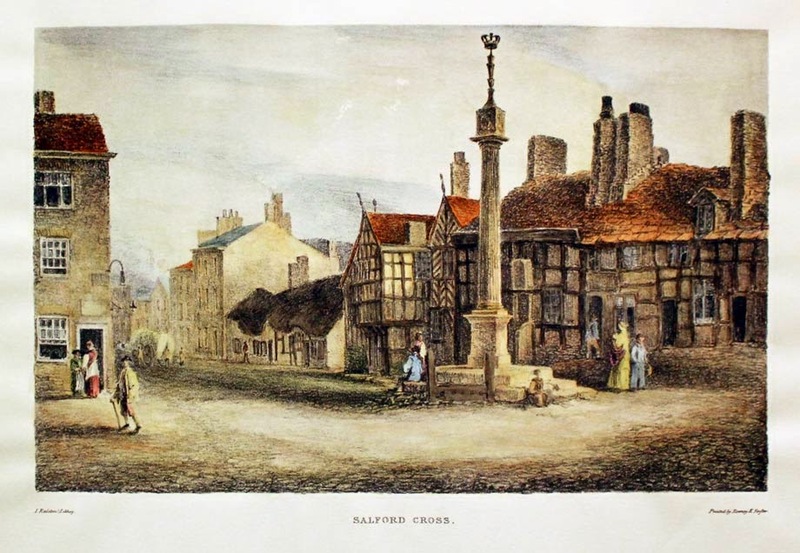 Salford Cross was demolished in 1824. 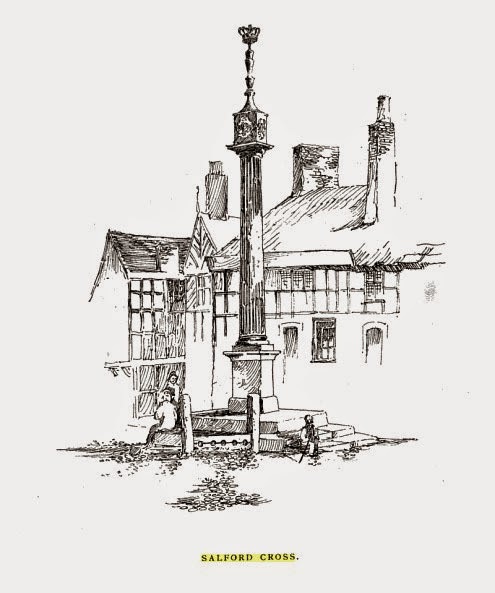 It was removed, along with the accompanying stocks and Salford's old Court House, sometime during the summer. As the population and traffic along the roads increased, it was in the way. 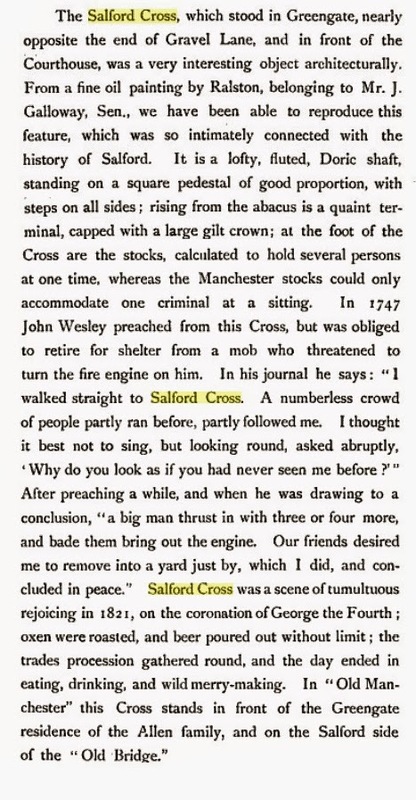 If Salford Cross was a proclamation cross designed for the dissemination of information, it had outlived its era. 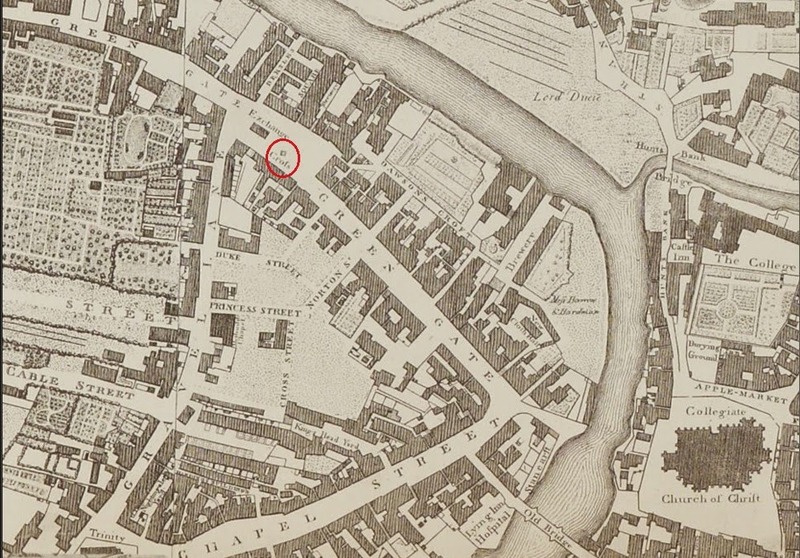 Three years before it was pulled down, the Manchester Guardian published its first newspaper. 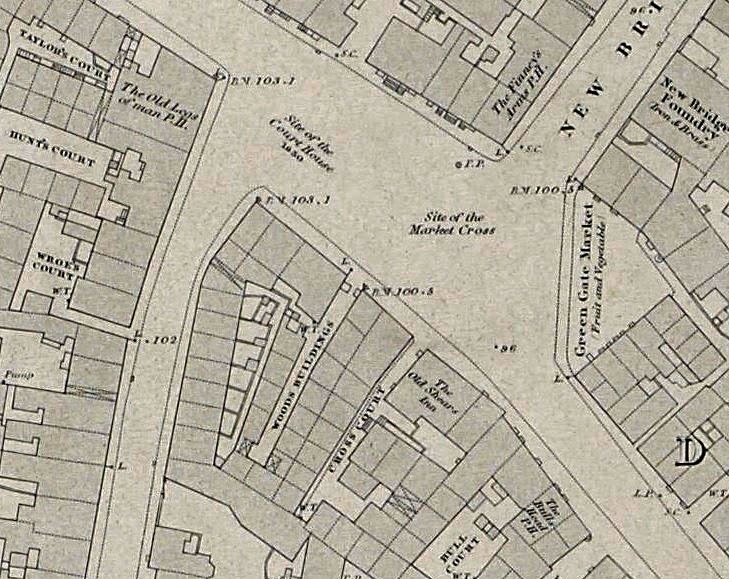 It was reported in November 2013 that the developer of an apartment block, to be built on New Bridge Street, Greengate, proposed to build a replica of the Salford Cross. John Ralston was born in 1789 and died in 1833. 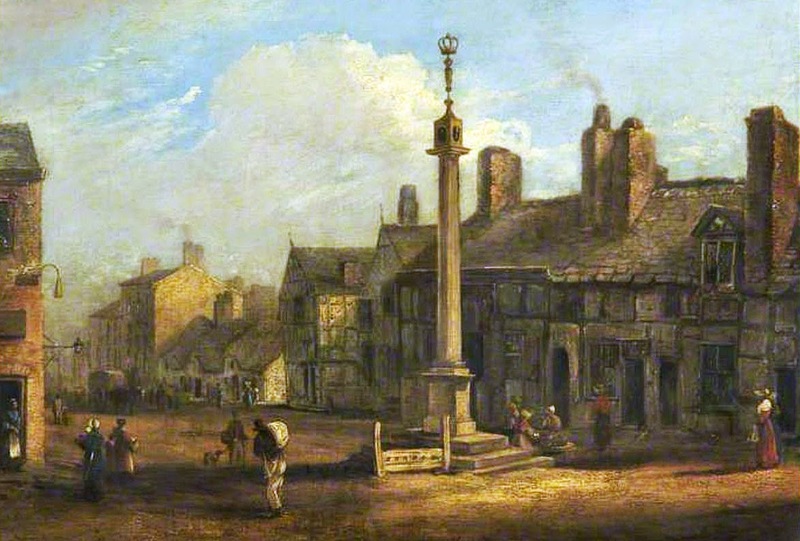 He was a pupil of Joseph Parry (1744-1826), the pre-eminent Manchester painter, who painted views of Manchester and its old buildings, and of the Manchester landscape painter, John Rathbone (1750-1807).